Researchers at the Mayo Clinic inserted rhesus macaque and jellyfish genes into unfertilized cat eggs. Interestingly, the cats appear to be resistant to feline AIDS and ZOMG! Glow-in-the-dark kitties!!! The scientists created three genetically modified kittens that may help develop a treatment for feline AIDS, which is plaguing the cat population. Researcher Eric Poeschla says, "We want to see if we can protect the domestic cat against its AIDS virus, if we can protect any species, eventually including ours, against its own AIDS virus." 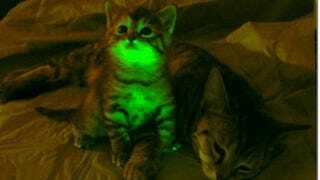 The cats only glow under a certain light so researchers can tell if the genetic engineering succeeded. Being ridiculously adorable is just a side effect.